And here we are, at Part 5 in this ongoing series about a train trip my father and I took in August/September 2013 on the legendary Trans-Siberian. If you’ve missed earlier installments, check out Part 1, Part 2, Part 3 and Part 4. Enjoy! 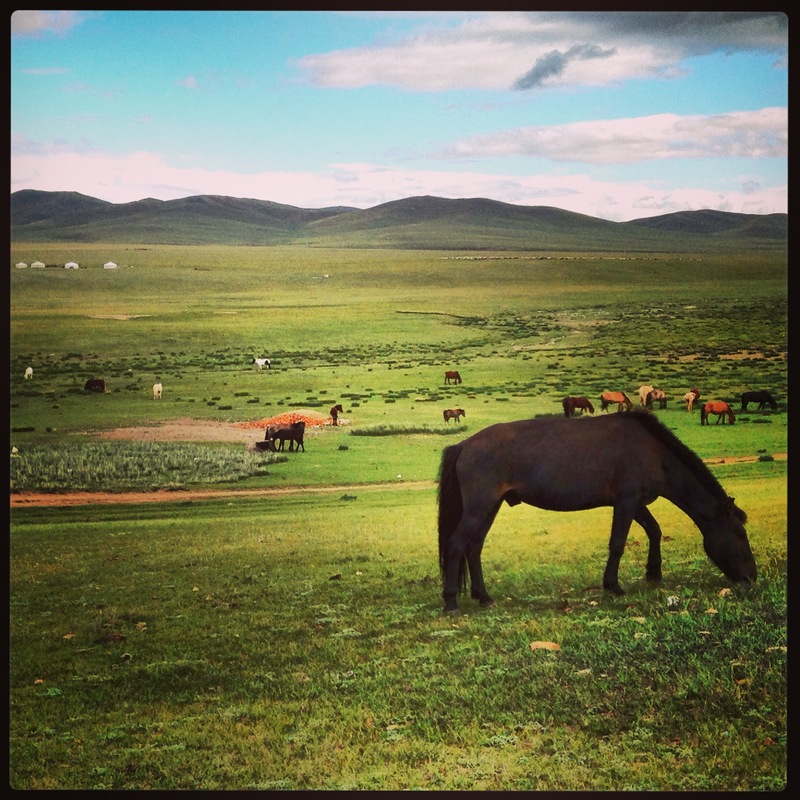 Mongolia – the name has an exotic ring to it – land of nomads, warriors, harsh weather and immense open spaces. How could this isolated people once have conquered so much of the globe, then retreated in to near seclusion? How do its citizens currently deal with globalization and an interconnected world that’s likely pulling at the fabric of their traditional society? These were but a few of the questions pondered as our train crossed northern Mongolia towards the capital Ulaanbaatar (UB). The morning sky turned from black to deep blue, then hints of orange appeared and finally it became a clear, crisp blue. Round, traditional ger tents that many Mongolians still call home speckled the landscape as we neared UB, gradually increasing in density. Then they were set within ramshackle wooden fences and finally concrete buildings dominated the scene as we arrived at the city’s railway station on an early morning in late August. We bid farewell to our Chinese train, which would continue its journey further south to Beijing, looking very forward to a one-week respite after riding the rails six-days straight from Moscow. We’d arrived in the land of Khans and one of the first things spotted after striking out from our hotel was a KFC. Recently opened, the Colonel’s smiling face beamed upon passers-by and served as an ideal statement of where the capital currently sits. The outside world is coming, people and landscapes are rapidly changing. Mongolians are racing to keep up in a land that will likely see more change in the coming decade than several centuries prior combined. Nearly half of Mongolia’s three million citizens live in UB, many have arrived from the countryside in the last couple years after unusually harsh winters killed off their livestock. The influx of people is no doubt a cause of the many cranes that dominate UB’s landscape. Once open plains are now home to apartment and office towers being built at a furious pace to keep up with new arrivals. A number of surprisingly modern office towers occupy the downtown core, there’s even a Louis Vuitton store, and Mongolians dressed in western business attire pass elders in traditional dress on every street. The collision of worlds while strolling UB was staggering, at times feeling as though there are two entirely different realms operating in one place at the same time. I kept wondering how these semi-impoverished migrants are going to afford all the modern apartments that are being built, how they’ll adapt to living in them and working in a big, busy city? Then again this is a nation of hardened nomads used to life’s struggles and the challenges it dishes out. After a couple days exploring UB’s sites it was time to get out of the city and in to what it’s famous for – great big, wide-open spaces. City rapidly gave way to smooth, rolling, grass-covered hills, or steppe as its known. The images seen in magazines and on TV are accurate – it really looks that green and pleasing. We spent a couple days at a ger camp for tourists, being assigned our very own round tent equipped with two beds and a wood stove for keeping warm at night. While this was still summer, UB is the coldest capital city on earth and summer is a relative term, with temperatures getting down to the low single digits during our stay. There was certainly no sun tanning going on. The lack of obvious, traditional tourist things to do was exactly the point of being here. 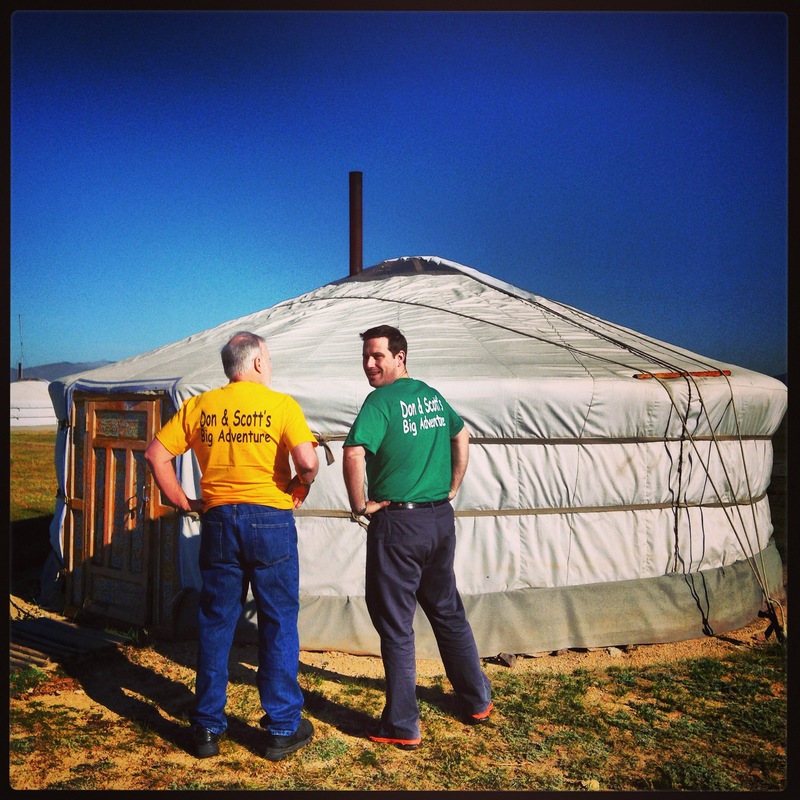 This was an opportunity to slow down and get in touch with the pace of life on the steppe. Atop a ubiquitous Mongolian horse, I enjoyed the experience much more than anticipated and shudder to think I almost didn’t do it. While small, trotting along the countryside made me think about Genghis Khan’s voyages, and my horse suddenly felt much larger and faster than it no doubt was. I was literally following in the footsteps of one of history’s greatest figures – what an opportunity! Rather than visiting a ‘traditional nomadic family’, which was part of the camp’s activities, my father and I headed out for a hike up a grassy mountain, passing goats and cows as we made our ascent. From the top we gained a larger appreciation for the vastness of this wide-open nation. Rolling hills, small mountains and rocky outcrops stretched as far as the eye could see. While traversing a smooth ridge on our way down we passed about 50 horses that gave us a curious gaze, no doubt wondering what these two strange looking foreigners were doing in their backyard? 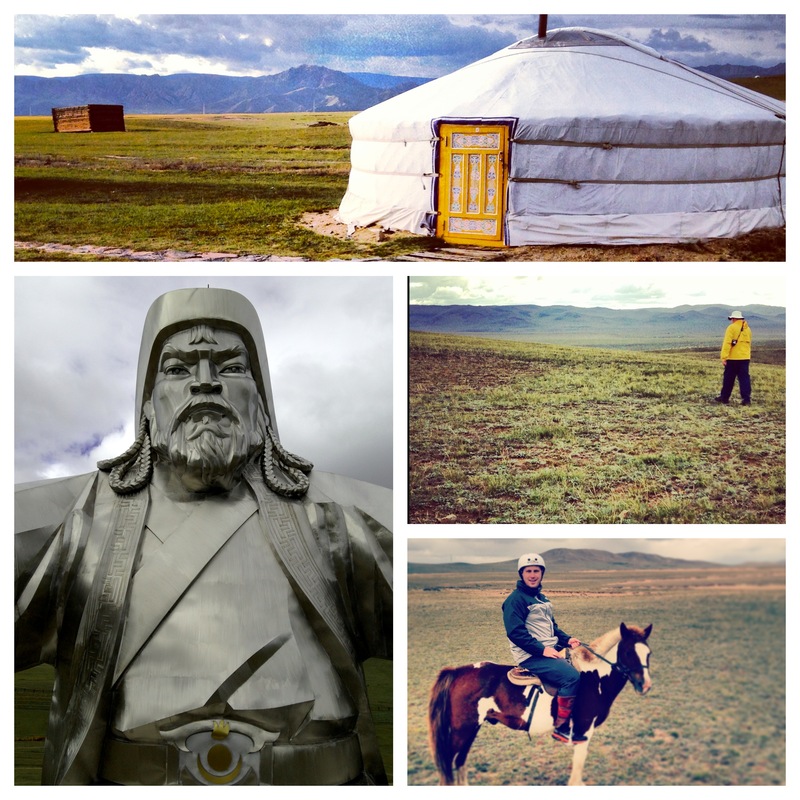 Our second ger camp at Hustai National Park provided a real treat. Set amongst a sandy, desert-like environment, we got the opportunity to see Przewalski horses. Once almost extinct, they were bred in European zoos then reintroduced to their native Mongolia in 1993. Today there are 1,500 animals and they’re the only horse of purely wild breed, not tainted by domesticated varieties. As the sun set on our final evening on the steppe my thoughts shifted to the confined life we were about to experience again on our train to Beijing. Rolling out of UB aboard a very modern Mongolian train on a cool morning, watching smoke bellow from ger smokestacks, I questioned how rapidly growing cities with limited infrastructure and financial resources can succeed? Will citizens’ lives really be better moving to the big city or would their long-term quality of life be superior living in their traditional regions? This would likely mean forgoing higher levels of hard currency, education and health care, but would also avoid the ugliness of eking out an existence in a foreign urban environment, often not friendly to tradition ways. In the 6th and Final Part we’ll wrap-up the journey! I’m so jealous, the trans siberian is one of my dreams! Thanks for your note. 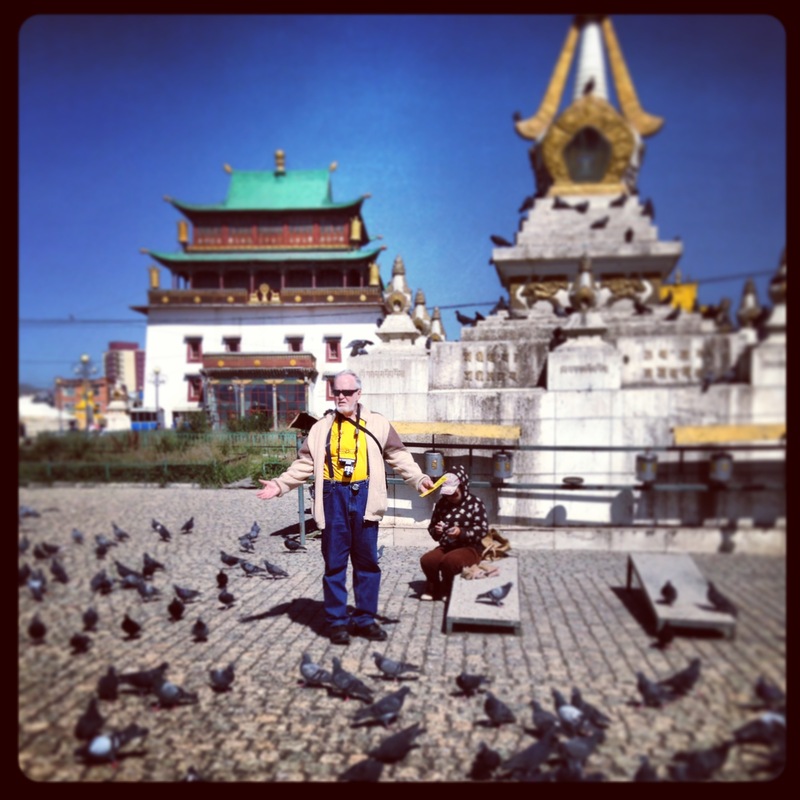 I’ve had a quick look at your website and am interested in being interviewed about Mongolia for your Postcards feature. You can reach me at: scottmcoates@gmail.com and scottcoates73 on Skype.